Review: A true story of Eric Lomax. He was a British Army officer who was tormented as a prisoner of war at a Japanese labor camp during World War II. I was really disappointed with this film. It could have been so much better than this. I just didn’t think that Jonathan Teplitzky did a very good job of directing. The first half was really slow but towards the middle the time went more quickly. The film started to pick up a bit more. Going back in time to when Eric Lomax was at the labor camp didn’t work very well. It was all very confusing at times as to where each character was where. You never quite knew. I have heard that this story has been adapted quite a few times already, one of them with John Hurt in called “Everyman” Prisoners in Time (T.V. Episode 1995). I felt that they could have worked on the script a bit more. One film critic said “It is a story of capture, suffering, pain, purgatory, redemption and the need for healing, forgiveness and reconciliation”. This is true but I am not sure now much of the film picked up on these points. 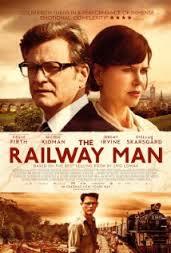 Colin Firth himself suggested Nicole Kidman and Jeremy Irvine for the roles. This reminded me a lot of the film Bridge on the River Kwai but is nowhere near as powerful.